The 33.53 metre motor yacht Halftime has just had a $205,000 price drop at her listing agents for sale, 26 North Yachts. 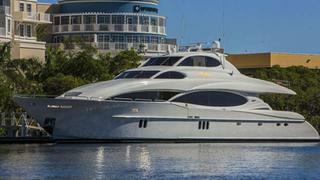 Halftime was built in GRP by US yard Lazzara with delivery in 2005 and a refit in 2014. The main saloon features an exquisite combination of polished rich cherry wood, brand new carpeting, custom fabrics and works of modern art. The showpiece is a one of a kind cocktail table made of the rare pairing of shagreen, polished wood and steel. The aft seating area offers a sofa, loveseat and an entertainment centre with a state of the art, retractable television. The new audio/visual system is complete with iPod controls and ‘One Touch’ electrical lighting. Additionally, there is a games table with chairs and two conversational loveseats on an onyx floor. To starboard there is a wet bar which includes an ice maker, fridge, wine cooler and storage for bar-ware and accessories. A cocktail party for 30 people or more can easily be served. Accommodation is for eight guests in four cabins including a full beam master suite and three VIP double cabins, all with en suite facilities. The aft deck offers a great area for al fresco relaxing, dining or entertaining. This area includes a completely equipped bar, a large teak dining table with ample seating and port and starboard boarding gates. There is also access to the sun deck, the swim platform, the transom and an on-deck doorway to the crew area and engine room. Twin 2,000hp MTU engines give her a cruising speed of 21 knots. On display at the upcoming Miami boat show, Halftime is down from $5,200,000 to $4,995,000.